So far parkern has created 29 blog entries. Manufacturing is alive and prospering! After surviving the Great Recession, manufacturers are finding new ways to bounce back from the challenges of a relatively slow-growth economy. A panel of professionals from different industries came together to share their experiences when dealing with the recession and how it affected their respective businesses. The event comprised of a long discussion featuring corporate culture, labor, the rise of robots, as well as corporate growth initiatives, R&D goals, smart innovations and ways to mitigate risk in the months ahead and year ahead. The panel of business professionals fielded questions from the audience to gain insight into business during the Great Recession, while sharing their experiences. Midway thru the event, the audience was engaged with a few real-world problems. Each table was tasked with finding a solution to the problem, based on what was discussed during the panel. Splitting up the room not only involved audience participation, but it forced conversation among tables that resulted in networking. Overall a lot was learned, and the panelists had fun digging at each other to garner thoughtful discussion. There was no holding back! 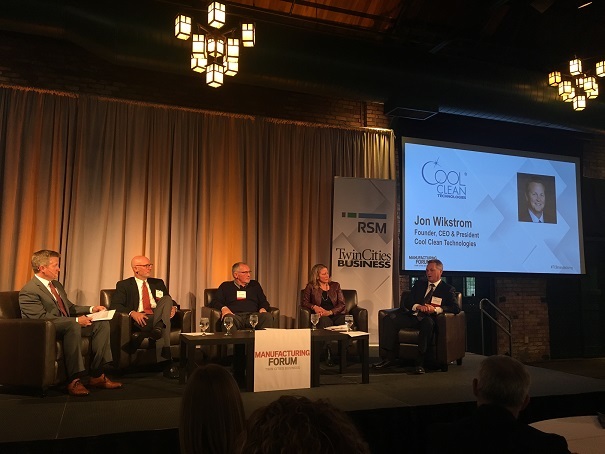 Continue reading to learn why Cool Clean Technologies’ founder was invited to be on the panel and other highlights gathered from the event. Enjoy! CO2 spray technology offers unique particle and organic residue removal benefits. Requirements of component cleanliness are constantly increasing and the automotive industry is no stranger to these stringent guidelines. Improper cleaning can lead to expensive rejects, labor intensive re-work, and restrictions in functionality. High level standards for cleanliness of components in the automotive industry has introduced new alternatives to improve the cleaning process for pretreatments, finishes, varnishes, and coatings. 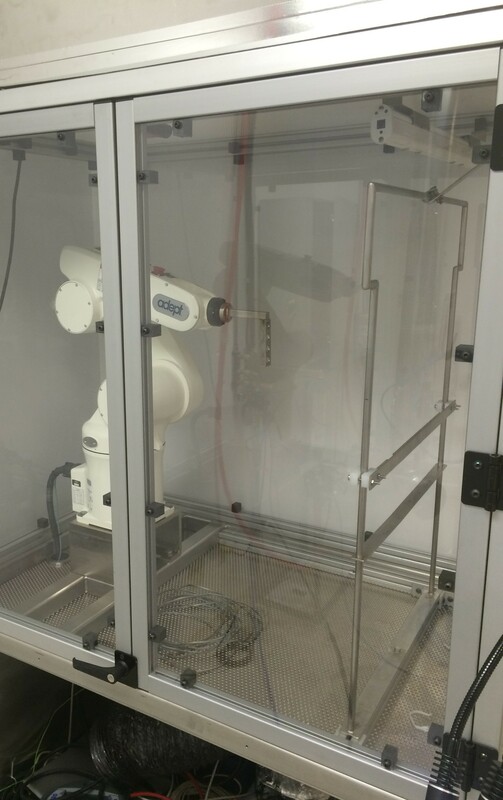 Carbon dioxide (CO2) based spray technologies have been successfully implemented to meet these requirements, along with other precision cleaning and surface preparation applications. CO2 spray cleaning is a waterless solution adaptable to various shapes and sizes of parts, including, but not limited to bumpers, dashboards, head lamps, spoilers, and other interior and exterior parts. 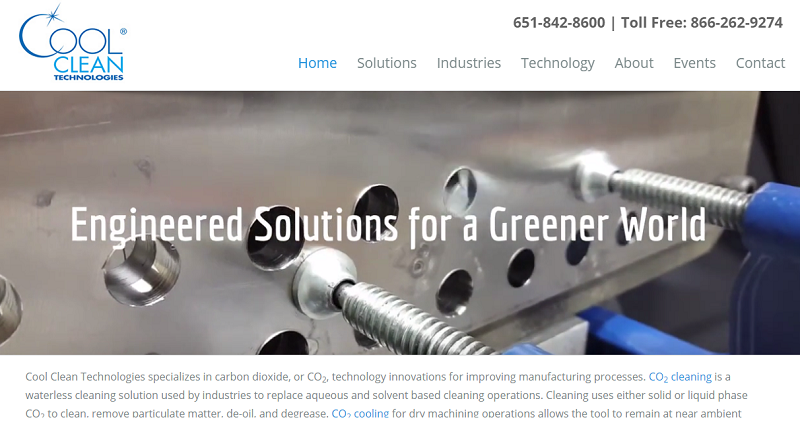 Cool Clean Technologies officially kicked off 2016 by doing an overhaul on the current website. As the market for CO2 expands, more people are interested to know how this innovative technology will play a factor in manufacturing applications. 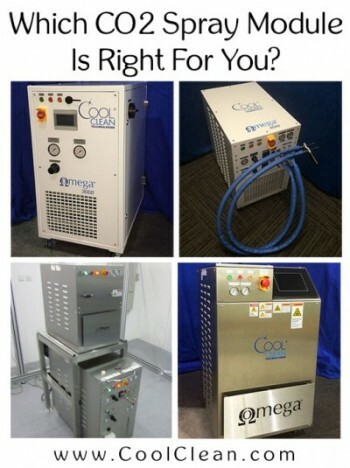 Being a leader in CO2 technology solutions, Cool Clean has stepped up to make the information relevant and industry specific. Improvements in content, pictures, videos, and overall layout will make it easier for interested visitors to enhance their education on CO2 technology. This blog will describe the reason behind the new layout, introduce the “Solutions” tab, and explain the adjustments to the “Industries” tab. After reading, please make sure to check out the new layout and let us know what you think! There’s a lot to be said for carbon dioxide. CO2 is one of the most abundant chemicals on the planet and yet it’s the least understood. This is due to the negative associations it has with climate change. Over the decades, we’ve come up with terms like “carbon tax” and “carbon footprint,” which may have you convinced the compound is public enemy No. 1. While it may be true that much of the recent changes in our climate is due to an increase in industrial CO2, that doesn’t mean the gas can’t also be used in a way that has a positive impact on the planet. 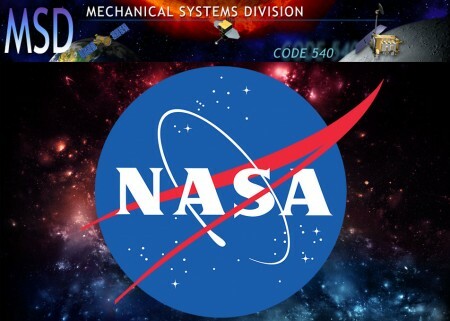 Cool Clean is proud to have been invited by NASA to participate in an upcoming event at the Goddard Space Flight Center in Greenbelt in Maryland as part of the Mechanical Systems Division, specifically the Contamination and Coatings Engineering Branch. Which CO2 Spray Module Is Right For You? Complex, delicate and challenging cleaning requires specialized tools. 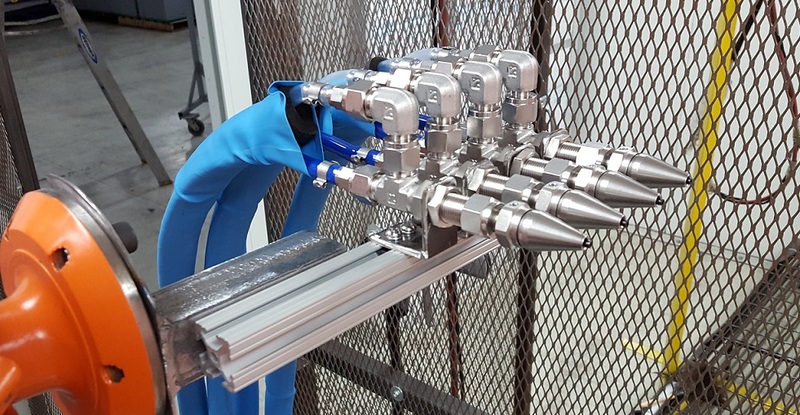 One such tool Cool Clean has developed is the CO2 precision cleaning line. Integrated spray cleaning systems such as these use carbon dioxide in a solid state. The CO2 can be used to clear the surface of contaminants and prepare them for the next step in the manufacturing process. Micro particles, light oils, and dust are all cleared away with the help of this remarkable tool, all without leaving behind any residue or condensation. Integrated spray cleaners do not come in a one-size-fits-all version. Rather, because of the complexity and variety of the surfaces these tools can be used on, we’ve designed a number of different spray modules to suit your needs. In order to find the module that will work best for you, it is essential to understand each design option. After several years working in both civilian and military careers, Jon Wikstrom decided it was time to use his experience to change the world. He had been working on a relatively unknown technology and believed in its potential enough to quit his career and launch something new. His goal was to develop this innovative technology and make it available to forward-thinking companies who wanted to go green and improve the efficiency of their operations in one fell swoop. 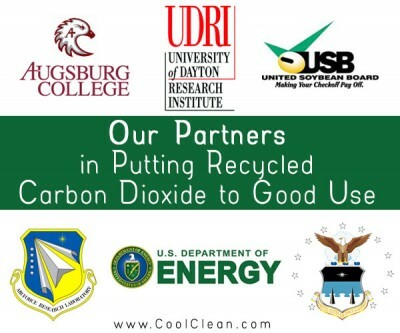 The company he founded in 2001 in Eagan, Minnesota, was called Cool Clean Technologies and the revolutionary products it sought to bring to market were all based on harnessing the power of carbon dioxide in ways that would help businesses in a wide variety of industries to save money and time. One of the best things about our CO2 cleaning systems is the fact that it has a wide range of applications in industries ranging from aeronautics to jewelry to electronics – we can build custom systems that are perfectly suited to each industry. 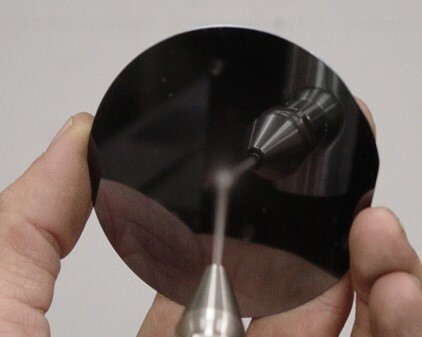 But one of the more unique and innovative applications is that of our CO2 based atmospheric spray system for treating optical surfaces, where we combine our CO2 spray cleaning with an atmospheric plasma tool. To get a better understanding of this system, we must learn what makes CO2 cleaning and atmospheric plasma successful, and why that led to combining the treatments. Carbon dioxide is one of the most abundant gases in our universe. We are creating tons of it on our planet, there are dry ice caps on Mars and even Venus has a carbon rich layer. But for all its abundance, it is still not very well understood by the general public. It isn’t even fully utilized in industrial applications. For example, many in the business community would have no idea that CO2 can be put into a liquid state and that this liquid can be a very eco-friendly and efficient way to get rid of contaminants.